Better Buy: Alcoa Corp. vs. Silver Wheaton Corp. Here are two great commodity stocks, but one could offer better value for your money if bought today. You generally wouldn't pit Alcoa Corporation (NYSE:AA) and Silver Wheaton Corp. (NYSE:SLW) against each other, but both make great bets for investors in commodities. Alcoa is among the world's leading manufacturers of aluminum while Silver Wheaton makes money selling silver and gold. The two companies are at an interesting juncture right now, what with Alcoa trying to find its footing as an aluminum pure play after having recently separated from its value-added business Arconic (NYSE:ARNC) and Silver Wheaton overhauling its image by reducing reliance on its core metal, silver. The story gets even more interesting when you realize how Alcoa stock has shot through the roof, gaining almost 46% in the past six months even as Silver Wheaton gave up 15% of its value during the period. So, should you chase Alcoa bulls right now or put your weight behind Silver Wheaton? It all boils down to which company can make more money going forward. On the face of it, Alcoa's and Silver Wheaton's businesses appear easy to understand: mining products and selling them. Alcoa's is pretty much the case, but Silver Wheaton is a different ball game altogether. Alcoa owns large ore reserves and interests in third-party mines from where it secures bauxite, its basic raw material. Through its eight refineries across five continents, Alcoa then extracts alumina from bauxite and processes it further to produce aluminum. Alcoa sells more than 60% of alumina to external customers. As both alumina and aluminum prices are dynamic -- aluminum is traded as a commodity on the London Metal Exchange while alumina's price is linked to the Alumina Price Index -- any fluctuations in them affect Alcoa's revenues and profits. Image source: Silver Wheaton's corporate presentation, March 2017. There's a risk with this kind of a business, though: Silver Wheaton has no control over "production" per se. If production at any of the miners takes a hit because of macro or internal factors, Silver Wheaton suffers. Alcoa, on the other hand, can flex its production levels per demand. That said, the pros of a streaming business far outweigh that of mining. Low costs and high margins count among Silver Wheaton's biggest competitive advantages, thanks to its purchase costs that average $4 per ounce of silver and $400 per ounce of gold. If you have the slightest idea what the spot gold and silver rates are, you can imagine the margins Silver Wheaton must be enjoying. 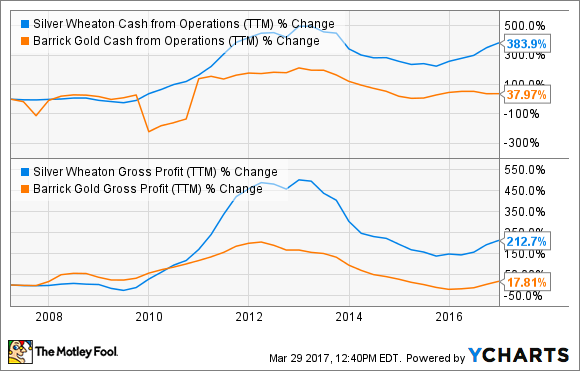 For perspective, check out the growth in Silver Wheaton's and Barrick's gross profit and cash from operations in the past decade. SLW Cash from Operations (TTM) data by YCharts. Such low costs also mean that Silver Wheaton should be able to generate enough cash to sustain operations even if prices of gold and silver were to fall by double digits. That certainly can't be said of Alcoa, which is why the company has been striving so hard to reduce costs to offset any rise in prices of input like carbon products and caustic soda or fall in alumina and aluminum prices. Alcoa management is, in fact, doing a commendable job of making the company more cost efficient than ever: Today, Alcoa is down to the 17th percentile on the global alumina cost curve from 30th percentile in 2010. Also, Alcoa isn't as heavily indebted anymore except for its pension liabilities, having offloaded the bulk of its debt to Arconic. Unfortunately, no matter what management does, Alcoa's fortunes are at the whim of commodity prices, which is why the company has been piling on losses for several years now. With the high-margin value-added business also gone to Arconic now, Alcoa's pure-commoditized bent could make it even more difficult to earn profits. Sure, aluminum's versatility as a metal might be attracting the attention of auto and aircraft makers alike, but price could remain the biggest determinant of Alcoa's profits. And that'll likely remain volatile, what with China influencing supply to a great extent. In sharp contrast, Silver Wheaton is a profitable company that has consistently generated strong operating cash flows despite the volatility in precious metal prices. It has even paid a dividend every year since 2011. Though not fixed, as its quarterly dividend equals 20% of its trailing four quarters' average operating cash flow, investors at least have some extra income to look forward to -- a privilege Alcoa investors don't enjoy. Silver Wheaton's diversification should also offer better value to investors going forward -- It estimates gold to average 45% of its total production through 2020. Why, management even wants to drop "silver" from the company's name and change it to Wheaton Precious Metals Corp. Given the backdrop, I'm all for buying Silver Wheaton right now. Alcoa has its growth catalysts in place, but the stock has already gone ahead of itself even though the company has yet to prove its mettle.